Born January 8, 1935, Elvis would have been 80 today. Most of us can’t picture him in some sad Tupelo retirement home; we think of him immortalized at the peak of his swaggering youth and his amazing talent. (That voice!) If you are in Memphis this week, there are many events celebrating The King of Rock n’ Roll’s birthday. Graceland is party central for most of the festivities including music tours, guest speakers, a gospel concert, and a double feature screening of Jailhouse Rock and Viva Las Vegas. After moving from Tupelo, MS and living in a series of boarding rooms and apartments, in September, 1949, Vernon Presley moved his family to the Lauderdale Courts, a 433-unit public housing project on the north end of downtown Memphis. (They lived in apartment 328.) Elvis would practice his guitar in the basement laundry room and he played in a band with four other boys from Lauderdale Courts. It is still maintained in period detail with fixtures and furnishing from 1951 and you can tour the historic landmark, including his bedroom. Humes High School, where Elvis Presley attended from 1948 to 1953, is still standing and operating as a school. The building was constructed in 1924, and was placed on the list of National Register of Historic Places in 2004 due to its connection to Elvis. In April of 1953, a few months before graduation, Elvis Presley performed in the annual talent show held at Ellis Auditorium in downtown Memphis. He was listed number sixteen of 22 acts (as ‘Elvis Prestly’) and stunned everyone in the audience with his rendition of Teresa Brewer’s ‘Till I Waltz Again with You.`(He never recorded it.) He received more applause than anyone else that night and won first prize, returning for an encore. His classmates say this stand-out performance was true beginning of his rise to stardom. Located in what has become the trendy South Main Historic District, the Arcade Restaurant was one of Elvis Presley’s top hangouts. His favorite booth is near the back of the restaurant. Built in 1925 by the Zepatos family, it is one of the oldest family-owned businesses in Memphis. You can still order the fried peanut butter ‘n banana sandwich just like Elvis enjoyed. If you are on an Elvis pilgrimage, your trip should include a visit to his birthplace in Tupelo, Mississippi. Hop in your pink Cadillac with the top down and travel in style. Located about a hundred miles from Memphis, this little Southern town in northeast Mississippi is where Elvis spent his formative years, learning to play guitar and listening to a melting pot of American music–country, blues, and gospel. There are several events around town to commemorate his birthday. You can visit Presley’s boyhood home, a two-room shotgun shack built for $180 by his father Vernon where the family lived for about three years. It’s still standing in the original spot! Also featured is a church Elvis attended and sang in, The Assembly of God Pentecostal Church, and a statue portraying Presley at thirteen. This year, The Tupelo Community Theatre presents the one-act play “Graceland” by playwright Ellen Byron. The story takes place in June, 1982 as two women, Rootie and Bev, vie to be the first in line the day Graceland is opened to the public. As they wait for the gates to open, the two fans share their life stories and how much Elvis means to them. Elvis may have left the building forever but you can still experience what it was like to attend one of his concerts thanks to tribute artist David Lee. Lee is ranked in the top 10 in the world and he captures the spirit of The King on stage. photo by Look Up America! 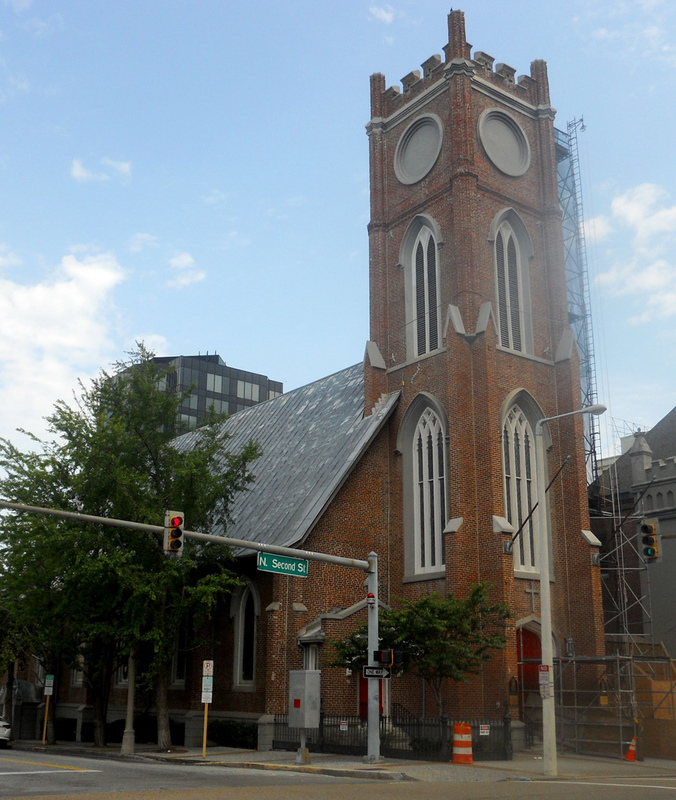 If you want to experience the joy of when blues and gospel music intersect, The Red Door Band plays the second Sunday of every month at the Calvary Episcopal Church, one of the city’s oldest and most prominent churches. Under the leadership of saxophonist David Lee, the band is made up of Memphis blues musicians Stella Payton, Verlinda Zeno, Dennis Falanga, Guy Venable, and Mike Forrest. They present gospel favorites like “Wade In the Water,” “People Get Ready,” “When the Saints Go Marching In,” and much more in a full Eucharist service. The informal service, with its gospel and blues vibe, is held at 5:30 p.m. the second Sunday of every month.